"Report: 70 Percent of Retailers Lack E-Commerce Strategy"
Rob's story was based on a new study by Deloitte and Touche that shows that while roughly one third of retailers with a Web presence consider their online store to be "strategic," a majority have set up Web operations with no clearly articulated strategy and are merely "testing the waters to gauge Internet demand."
. Many people clearly misunderstand the corporate meaning of the word strategic and confuse it with the related terms "tactics" or "plans". Clearly, Rob's story, and other points we will discuss in this class, strongly suggests there is indeed a market for people to advise and consult to companies as "E-commerce Strategists". That is to say, they may already have a web site up and running, your job is to massage it and see it fits the company's objectives. Goals-- Goals are the ultimate thing you want to achieve. They are the statements that a company uses to motivate employees and statements used to judge and measure challenges that you face. Excellently worded goals should include measurable statements. Objectives--"Every successful business campaign starts with clear objectives. Each objective should be attainable. These objectives will drive the overall direction of any plans, and will always help you judge whether a plan is working or not by how it can achieve the objectives. Plans--Plans are the ordered sequences of several strategies with a time element and additional information identifying supporting resources (human resources, technical resources, inventory, etc.). Strategies--Strategies are the collection of various tactics (organized and structured sequences of actions). Develop online giveaways to drive consumers to our product. Build links from the web sites of famous cosmetics brands and have reciprocal links. To develop Strategies, it has been taught in business schools for many years to use a SWOT Analysis. Tactics--"Tactics are the specifics of strategies". These are the specific ways and options you do things in order to carry out various strategies. Depending on which tactics you are able to employ (based on your access to resources) some strategies will work, some will fail. "Tactics are the who, what, when and how of the broad-stroke strategy." Establish ongoing monthly contests giving away sample product to 10 lucky winners. To enter, consumers must complete a data sheet, providing demographic information. Winners will be announced in the product category of the Web site to ensure consumers see our product line. In the 1st class, after we discussed GOPST, we did a practical exercise in class that involved the students working in groups to create a scenario for which a GOPST would be needed, and then write out on paper the various details. Class participation marks were awarded for this activity. "If you know yourself, but not your enemy, for every battle won, you will suffer a loss." Chinese military strategist, Sun Tzu "the Art of War"
A number of quoteable quotes are used by Sun Tzu in business all over the world. "Those who arrive early at the battlefield will be in a position to take the initiative." "To attain the Way of strategy as a warrior you must study fully other martial arts"
on this site is the table of contents, and entire text of each Chapter in Machiavelli's book "The Prince"
"He tried to gain the favor of the Medici [the family that ruled Florence, Italy in the late 1400's - early 1500's] by writing a book of what he thought were the Medici's goals and dedicating it to them. And so The Prince was written for that purpose. Unfortunately, the Medici didn't agree with what the book said, so he was out of a job. But when the public saw the book, they were outraged. The people wondered how cruel a man could be to think evil thoughts like the ones in The Prince, and this would come back to haunt him when he was alive and dead." All organizations have specific goals and objectives that they strive to meet. General managers and top executives devise strategies and formulate policies to ensure that these objectives are met. 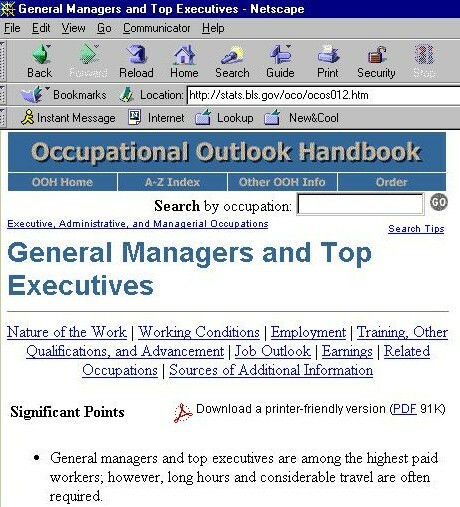 Although they have a wide range of titles—such as chief executive officer, president, executive vice president, owner, partner, brokerage office manager, school superintendent, and police chief—all formulate policies and direct the operations of businesses and corporations, nonprofit institutions, and other organizations." Top executives are usually provided with spacious offices and support staff. General managers in large firms or nonprofit organizations usually have comfortable offices close to the top executives to whom they report. Long hours, including evenings and weekends, are standard for most top executives and general managers, though their schedules may be flexible." General managers and top executives held over 3.3 million jobs in 1998. They are found in every industry, but wholesale, retail, and services industries employ over 6 out of 10. General managers and top executives are among the highest paid workers. However, salary levels vary substantially depending upon the level of managerial responsibility, length of service, and type, size, and location of the firm. "To be an effective manager you must be a good time manager."
. One of the things that causes the most stress for managers at all levels of an organization is the increasing pressure to do more things in less time. Management "To be an effective manager you must be a good time manager." This screen capture links to a site (suggested by the textbook) which contains some online self-evaluation tests which can help youa ppreciate your own time management skills. In 1965 the average CEO made 44 times the average factory worker. Today, the average CEO makes 212 times the salary of the average worker. Earnings There are many newspaper stories, online and offline, about how salaries for top managers continue to grow, even when it seems that this would be unpopular with lower level employees, stockholders, and customers.
. Although we may feel sympathy for the time management stress that top managers deal with, one of the things we have difficulty feeling sorry for is the higher income tax bracket in which top managers exist from medium and large size companies. It remains a point of contention and friction that top CEO's continue to be paid amounts which seem way out of proportion to the lower level employees. Some people defend this position by saying "look at the money we pay professional athletes, singers and actors". 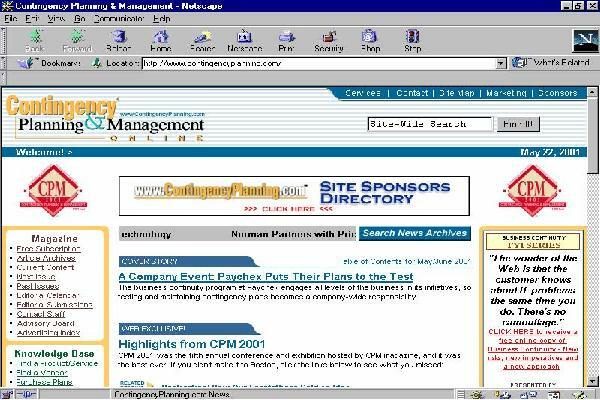 In this screen capture above, we have a story written by the well known journalist Terence Corcoran, talking about the fact that many companies have done poorly in the economy in early 2001, yet those companies are still paying extremely high salaries to their top managers. when singers record an album no one buys, they lose money. Sometimes good intentions don't work out. Corcoran explains that "Ontario's NDP government opened the floodgates of compensation envy back in 1993 when it forced Canadian companies to disclose executive salaries. So far, the only impact of the disclosure has been to drive compensation higher as companies now compete more aggressively for talent."
. Contingency Planning is not "Good" planning. It is planning for when things go bad. In order to be adept at contingency planning, you have to have as much information as possible about the weakness of your organization and resources, then imagine all the bad things that could happen which would effect you negatively. Contingency planning can be considered "Good", when the plans you create are successful in dealing with any of the bad situations that arise, and prevent harm to your human resources, and prevent loss to your property, inventory, and resources. 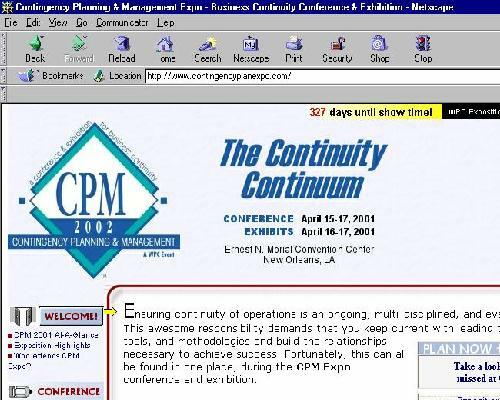 "keeping your business going even though really bad stuff happened to the company"
It is possible to find many web sites with information about contingency planning & business continuity solutions. This conference, put on in April 2001, begins by saying "... continuity of operations is an ongoing, multi-disciplined, and ever-changing task"
In the 3rd class, after we discussed contingency planning, we did a practical exercise in class that involved the students working in groups to create a scenario for which a Contingency Plan was needed, and then write out on paper the various details of the plan. 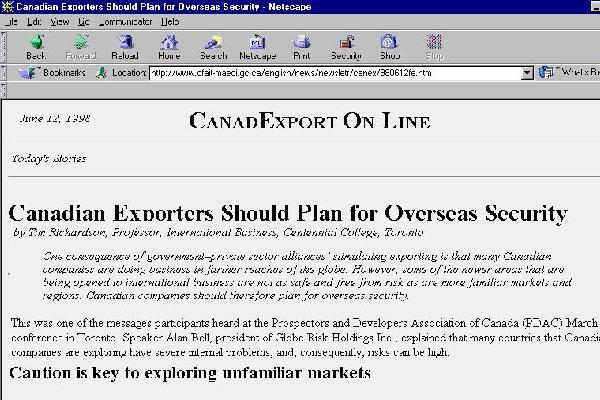 The screen capture above is from the web site of CanadExport of the Dept. of Foreign Affairs. "One consequence of government–private sector alliances’ stimulating exporting is that many Canadian companies are doing business in farther reaches of the globe. However, some of the newer areas that are being opened to international business are not as safe and free from risk as are more familiar markets and regions. Canadian companies should therefore plan for overseas security." "...these newer areas can be rewarding for exporters, but Canadian companies need to exercise caution. ...Contingency plan one way to address risks"
natural disasters, evacuation of personnel and recovery of equipment and property. There are some preventive measures that can be taken to reduce the effect of threat and risk. Register with the local Canadian embassy or consulate in the region. Ensure that all at-risk personnel, and their support staff and team members, understand the action items they need to follow in contingency plans. Invest in access to international security consultants and treat their services as part of your core resources. Incorporate security considerations into your initial plans. Identify security resources within your existing staff, including medical and first aid knowledge, language abilities, logistical and transportation expertise and so on. Develop security strategies with other Canadian companies operating in similar regions and situations of risk, including strategies for joint evacuation, medical assistance, terrorism incidents and perimeter security. 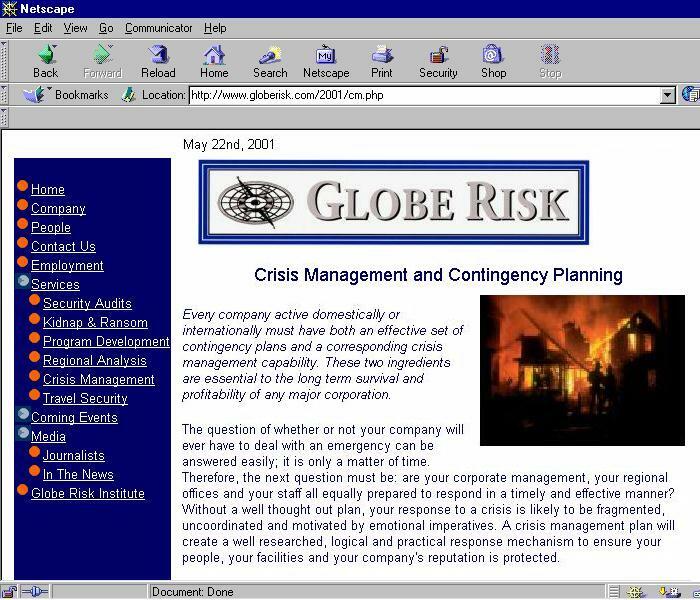 Globe Risk, "There are many questions when it comes to contingency planning and crisis management. Similar to an insurance policy, it prepares your company for any disasters it may encounter. Even more like an insurance policy, it can either be money wasted or well spent. When a crisis strikes your firm, it will be too late to find out. Then it will be up to legal teams representing damaged parties, injured employees and government regulators to determine your liabilities. " Once you understand what it takes to make good plans, to achieve the objectives, to satisfy the goals, it is necessary to have an understanding of some of the barriers which would stop you carrying out the plans effectively.
. Management By Objectives, MBO, is also called, in business management theory, Performance Management. It is not an exact science. There are many people who teach business, and who run businesses, that have different opinions about whether MBO and Performance Management are good, or bad. The textbook speaks positively about MBO, but also admits that MBO occasionally fails. MBO is a collaborative process whereby the Leader and team members can jointly determine objectives for each team members. MBO begins when the Team Leader explains the goals for his group. The team members take the goals and propose objective for his / her particular job. In case of any modification of individual’s objectives, it is accomplished through negotiation since the Team Leader has resources to help the team member commit to the achievement of the objective. Thus, a set of verifiable objectives for each team member are jointly determined, prioritized and formalised. Generally, an MBO system includes the following components. 1. Development of role & mission statement. 2. Establishing strategic goals/strategic plan. 3. Defining key results areas. 4. Establishing indicators or effectiveness, goals, or organizational objectives. 5. Establishing, or negotiating individual employee objectives. 6. Establishing performance standards for each objective. 7. Action planning for each employee. lO. Some form of evaluation or assessment done formally and included in an employee's record. What Is Performance Management Supposed To Accomplish? 1. Increases management control over work and results. 2. Increases management ability to identify or "red-flag" problems early. 3. Links employee objectives and functions to overall organization obj ectives, thereby creating a sense of contribution for the employee. 4. Motivates employees by allowing them input into and ownership of their obj ectives and standards of performance. 5. Enhances communication by ensuring there is clear understanding of management expectations about results. 6. Supports remedial action or disciplinary action because a breach of standards can be defined objectively and in a measurable way. 7. Provides a system where feedback can be given to employees on a more objective basis, and not on management's subjective criterion. 8. Provides objective criterion that management can use to make decisions regarding pay scale, and promotion. 9. Provides a centralized record of performance for each employee"
Some people, like Robert Bacal says that "while performance management can be described as absolutely logical, the assumptions underlying it that relate to organization effectiveness are somewhat flawed... traditional performance management contains many excellent notions, but that the positive things about it are lost in a morass of conflicting purposes that usually guarantee that it will not work." Robert Bacal says " Is it possible that traditional performance management programs cause problems for an organization? The answer is a resounding yes. The performance management system conveys to people in an organization how work is to be performed, and communicates, often unintentionally, values and organizational culture. More specifically traditional performance management systems can foster a lack of collective responsibility for the achievement of organizational goals, encourage competition rather than cooperation, and can impede the development of effective teamwork." MBO - the "Objectives" part.
. One of the consequences of studying MBO is a better understanding of corporate Objectives - which should fit within GOPST. "Most supervisors set objectives, but not with equal skill. Few, who do not correctly write objectives, will reap MBO's full benefits. An objective is simply a statement of what is to done and should be stated in terms of [measurable] results." An objective must be specific with a single key result. If more than one result is to be accomplished, more than one objective should be written. An objective must be measurable. Only an objective that affects behavior in a measurable way can be optimally effective. If possible, state the objective as a quantity - example, the number one company, by passenger car sales, in Toronto. An objective must be attainable with the resources that are available. It must be realistic. Many objectives are realistic. Yet, the time it takes to achieve them may be unrealistic. It would not be realistic for a truck dealership to switch to cars, and then say its objective is to be the number one seller of cars because competition would be too tough in the short run. The objective should be central to the goal of the organization. The successful completion of the objective should make a difference - If it is not, then the statement is not important enough to be an objective. The objective should be something that can be achieved in a resonable period of time, so that the goal can be met, without problems. Specific objectives enable time priorities to be set and time to be used on objectives that really matter. Are the time lines you have established realistic? Will other competing demands cause delay?
. MBO is not just a concept for business students in North American schools, it is widely understood around the world and applied at all levels. You can even find examples of where MBO is applied to the running of an entire country.